^ 1.0 1.1 郑师渠. 中国近代史. 北京师范大学出版社. 2007: 136. ^ 國立臺灣歷史博物館. 斯土斯民-臺灣的故事：帝國陸軍平壤大激戰之圖. 斯土斯民展品列表 - 斯土斯民-臺灣的故事. 國立臺灣歷史博物館. [2018-01-29]. （原始内容存档于2018-01-29）. ^ 國立臺灣歷史博物館. 斯土斯民-臺灣的故事：日清海戰之圖. 斯土斯民展品列表 - 斯土斯民-臺灣的故事. 國立臺灣歷史博物館. [2018-01-29]. （原始内容存档于2018-01-29）. ^ 陈先松. 《修建颐和园挪用“海防经费”史料解读》. 《歷史研究》. 2013年, (第2期). ^ James Allan. Under the Dragon Flag: My Experiences in the Chino-Japanese War. W. Heinemann. 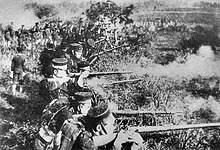 1898年: 27–28頁. ^ United States. Hydrographic Office. Asiatic Pilot: Coast of China, Yalu river to Hong Kong entrance III. U.S. Government Printing Office. 1920: 50. ^ 馬幼垣. 北洋海軍「平遠」艦考釋. 《嶺南學報》. 2000, (新第二期): 232–233. ^ 30.0 30.1 30.2 北洋海军惨败与炮弹不足无关. [2014-07-24]. （原始内容存档于2014-07-21）. ^ 戚其章. 《晚清海軍興衰史》. 人民出版社. 1998年: 416頁. ISBN 978-7-01-002648-0. ^ 戚其章. 《晚清海軍興衰史》. 人民出版社. 1998年: 421頁. ISBN 978-7-01-002648-0. ^ 35.0 35.1 清、日陆军武器差距有多大？. [2014-07-24]. （原始内容存档于2014-07-19）. ^ 北洋海军将领的素质有多烂？. 腾讯网. [2014-07-24]. （原始内容存档于2014-07-21）. ^ 没有任何人能够指挥北洋舰队. 腾讯网. [2014-07-24]. （原始内容存档于2014-07-23）. ^ 日本军工业如何远远甩开中国. 腾讯网. [2014-07-24]. （原始内容存档于2014-07-24）. 林亨芬. 近四十年來有關「甲午戰後清韓關係史」的研究回顧 (PDF). 歷史教育 (臺北: 國立臺灣師範大學). 2011年. 廖敏淑. 《中日修好條規》與甲午戰爭——以修約交涉為中心 (PDF). 抗日戰爭研究 (北京: 中国社会科学院近代史研究所). 2014年, (4): 1–14. 有賀長雄. La guerre sino-japonaise au point de vue du droit international [《日清戰爭國際法論》]. Paris: A. Pedone. 1896年 （法语）. Captain N. W. H. Du Boulay. 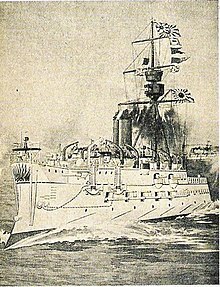 An Epitome of the Chino-Japanese War, 1894-95 [《中日战争简述》]. London: Her Majesty's Stationery Office. 1896年 （英语）. Zenone Volpicelli. 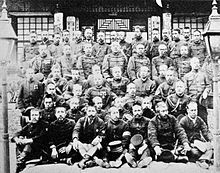 The China-Japan war compiled from Japanese, Chinese and foreign sources [《中日战争》]. London: S. Low, Marston and Company Limited. 1896年 （英语）. James Allan. Under the Dragon Flag: My Experiences in the Chino-Japanese War. London: W. Heinemann. 1898年 （英语）. 該書中譯本有： 詹姆斯·艾伦. 《在龍旗下——中日戰爭目擊記》. 费青/费孝通译. 上海人民出版社. 2014年. ISBN 978-7-208-12493-6. William Ferdinand Tyler. Pulling Strings in China. Constable & Company, Limited. 1929年 （英语）. 該書中譯本有二：泰莱著，张荫麟译《甲午中日海战见闻记》，刊于《东方杂志》28卷4期，1931年。 戴樂爾. 我在中国海军三十年 (1889-1920): 戴樂爾回忆录. 張黎源譯. 文匯出版社. 2011年. ISBN 978-7-5496-0214-8. M. Boulfray. Les Deux sièges de Port-Arthur, 1894-1904 [《旅顺口的两次被围: 1894-1904》]. Paris: Lavauzelle. 1907年. ASIN B000WQJ1FC （法语）. Auguste Gérard（法语：Auguste Gérard）. Ma mission en Chine (1893-1897). Paris: Plon-Nourrit et cie. 1918 （法语）. 該書中譯本有： A. 施阿兰. 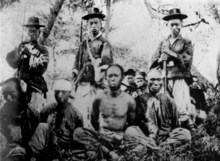 《使华记 1893-1897》. 商务印书馆. 1989年. ASIN B00AZBNJL6. 馬克斯·馮·巴蘭德（英语：Max von Brandt）. Drei Jahre ostasiatischer Politik, 1894-1897 [《1894-1897年三年的東亞政策》]. Stuttgart: Strecher & Moser. 1897年 （德语）. Amedeo Alberti. La Guerra Cino-Giapponese, 1894-95 [《甲午中日战争》]. Napoli, Italy: Melfi & Joele. 1904年 （意大利语）. 田贝（英语：Charles Harvey Denby）. China and Her People: Being the Observations, Reminiscences, and Conclusions of an American Diplomat [《中国及其人民——一位美国外交人员的观察、回忆与结论》]. Boston: L. C. Page & company. 1906年 （英语）. 科士達. Diplomatic Memoirs [《外交回忆录》]. Boston: Houghton Mifflin Co. 1910年 （英语）. 戚其章. 英人泰莱《甲午中日海战见闻记》质疑. 近代史研究 (北京: 中国社会科学院). 1982, (4).